TORONTO -- A man who killed two people when he opened fire at Toronto's Eaton Centre more than six years ago was suffering from post-traumatic stress disorder that caused him to disconnect from his actions, defence lawyers told his murder trial Friday. While there is no doubt Christopher Husbands fired several shots at the popular downtown mall's food court on June 2, 2012, the "fundamental question" is his state of mind in those moments, his lawyers said, arguing he should be found not criminally responsible. In his closing arguments, defence lawyer Dirk Derstine told jurors Husbands felt cornered and terrified when he unexpectedly came face to face with former friends at the mall that day -- the first time he'd seen the group of men since they brutally beat and stabbed him and left him for dead months earlier. "This is now a life or death situation (for Husbands)," Derstine said, describing the encounter as a coincidence that set off his client's worst fears. "He had already suffered terrible trauma at the hands of these people ... His mind couldn't deal with it." Two men were killed in the shooting and six others -- including a 13-year-old boy who was shot in the head and survived, and a pregnant woman who was trampled in the ensuing stampede -- were injured in the crossfire. 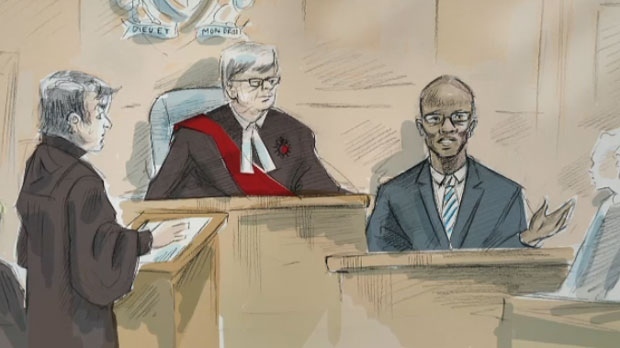 The Crown has argued Husbands was carrying out "street justice" in retaliation for the stabbing, but Derstine said that had his client sought revenge, he could easily have found the men in the Regent Park community. "If he'd wanted to find them, he would've found themΓÇªthey were not hard people to find," Derstine said. "He would have to be a saint to not feel those particular things," he said.